Nature’s Sunshine Blood Stimulator (Build), Chinese combines 18 herbs used in traditional Chinese medicine to nourish the circulatory system, liver function, and the glandular system. Bu xue, the Chinese name for the formula, means “to nurture the blood,” and it does just that by possibly improving blood quality and purity in addition to strengthening the immune system. 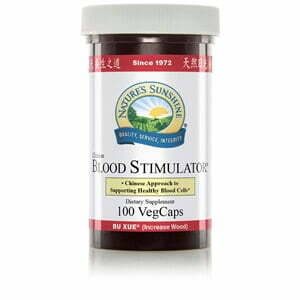 Blood Stimulator includes dang gui, alisma, peony, ganoderma, and atractylodes. Instructions: Take three capsules with a meal three times daily. For best results use with I-X and Skeletal Strength.